The Saskatchewan Roughriders announced on Wednesday international defensive back Justin Cox has signed an extension to remain with the team through 2018. As per team policy, financial details of the contract were not released. Cox (6’0 – 187) completed his first season in the Green and White after signing with the team in May, 2016. The 23-year-old Mississippi native started the first 15 games before suffering an injury that forced him to miss the final three contests. 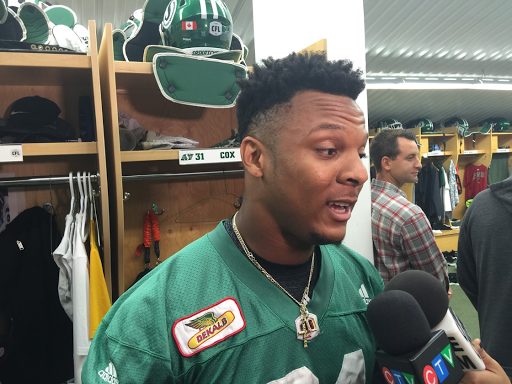 In his first CFL season, Cox picked up 42 defensive tackles and a team leading four interceptions on his way to being named the Riders Most Outstanding Rookie. The long term team build is in action, good! The team is now run in a professional manner with structure Boy are we ever going to have a very good club. The on field product will be amazing under the leader of qb Franklin. What a big relief the previous regime was rightly dismissed. Congrats Justin Cox. Go Riders Go! Go Riders Go! Cox is athletic but he was beaten over and over again by top level receivers. Not a resigning I'm excited about. Great signing. A professionally run franchise at last. He's one of the few 'discoveries' of the new regime that actually has some potential. Good signing. Should be a real star in his second year getting to know the CFL game! I suppose he may Improve if we get a better pass rush . Must have led the team in penalties for sure. Not at all happy about this signing. Must have signed cheap. Shocked that the Rider brass never checked with you first.